Del Mar, the historic oval that will be presenting its 80th summer of racing alongside the blue Pacific starting on Wednesday, July 17, will offer its horsemen a robust stakes schedule consisting of 40 events worth nearly $7.4 million during its 36-day stand. The shore racing headquarter’s richest and most prestigious day will come on Saturday, August 17 when the $1,000,000 TVG Pacific Classic will be presented for the 29th time as the highlight of a first-of-its-kind program made up of five stakes races which, when combined with the day’s remaining events, will provide a record $2-million-plus in prize money over the course of the afternoon. The stakes slate consists of 34 “advertised” stakes carrying purses from $100,000 to $1,000,000, along with six “overnight” stakes worth $85,000 each. Twenty-two of the “advertised” stakes are Graded – six at Grade I, 11 at Grade II and five at Grade III. The purse figure on the “overnight” stakes is a $10,000 boost from last year’s value. In the only major change to its stakes lineup, Del Mar had one of its previous “overnight” races boosted to Grade III status for this year – the Green Flash Handicap, a five-furlong turf dash that will be contested for the 17th time as part of the big TVG Pacific Classic Day card. It will carry a purse of $100,000. Nineteen of the stakes will be run on the track’s Jimmy Durante Turf Course, which was expanded and totally replaced prior to the 2014 season. The other 21 will be offered on its main track, which was returned to dirt (after an eight-year run with the synthetic Polytrack) in 2015. Del Mar invested more than $10 million in replacing the two surfaces. Additionally, the seaside testing grounds again will offer its usual compliment of eight California-bred stakes, part of the state’s Golden State Stakes Series consisting of 39 restricted stakes for registered California-bred or sired horses worth a total of $5 million. Del Mar’s Cal-bred stakes are the $150,000 Fleet Treat, $150,000 California Dreamin’, $150,000 Real Good Deal, $100,000 CTBA, $100,000 Graduation, $150,000 Solana Beach, $100,000 Generous Portion and $100,000 I’m Smokin. As in previous summers, five of the track’s key stakes have been scheduled as Breeders’ Cup “Win and You’re In” races, meaning a victory in any of them will guarantee the winning horse an entry – with all fees paid – in the corresponding Breeders’ Cup divisional race, along with a travel bonus if the horse is based outside of California. One of the “Win and You’re In” races is the TVG Pacific Classic, which guarantees admission to the $6 million BC Classic. Besides the $600,000 winner’s share of the purse, the victorious TVG Pacific Classic horse also has his or her pre-entry fees to the BC Classic covered – a sum of $150,000 – as well as the promise of a possible travel bonus of either $10,000 (national) or $40,000 (international), if applicable. The two-day Breeders’ Cup programs will be presented this year at Santa Anita Park on November 1 and 2. The other four “Win and You’re In” races are the $300,000, Grade I Bing Crosby Stakes on Saturday, July 27 (guaranteeing admission to the $2 million Breeders’ Cup Sprint); the $300,000, Grade I Clement L. Hirsch Stakes on Sunday, July 28 ($2 million BC Distaff); the Grade II, $250,000 Del Mar Handicap on Saturday, August 17 ($4 million BC Turf), and the Grade II, $200,000 Pat O’Brien Stakes on Saturday, August 24 ($1 million Breeders’ Cup Dirt Mile). 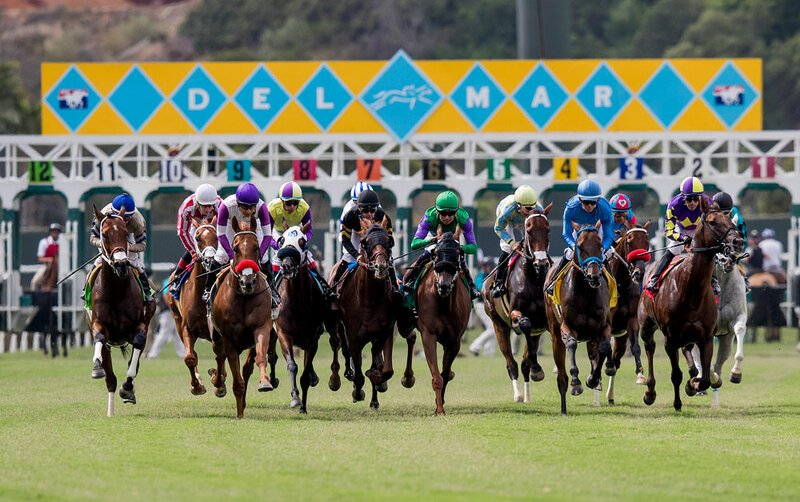 Del Mar once again will race on a five-days-a-week schedule (Wednesdays through Sundays) for the entire summer, finishing with a six-day week concluding on the Monday, September 2 Labor Day holiday. Post time throughout the session will be the normal 2 p.m. with the exception of Fridays (“Four O’Clock Fridays”) when the first race goes off at 4 p.m. for the first five of those days, then at 3:30 p.m. for the last two (August 24 and 31).